To create a verbatim transcript of a typical court hearing, an experienced Court Stenographer needs to capture the spoken word at an approximate rate of 250 – 350 words per minute or 40 to 50 pages per hour. Our court stenographers do this every day with a first draft accuracy of 98.5% or higher and with same day delivery provided. GMSS is the primary supplier of Court Stenographers and all related stenography services to the Irish Courts Service, public bodies and private entities. Our Court Stenographers consistently produce verbatim transcripts at hearings across the island of Ireland and internationally in a range of venues including the High Court, Arbitration Hearings and the taking of evidence on commission at off site locations for those unable to attend Court. The work of a Court Stenographer can be easily overlooked but in the digital information age, an accurate, reliable text recording of the spoken word by a competent Court Stenographer has never been more important. A competent Court Stenographer is not only responsible for accurately recording the spoken word as it is been spoken but is also responsible for the ultimate production of a verbatim text recording that is completely accurate, credible and reliable for intended purposes. GMSS and its Court Stenographers are renowned for their rapid deployment and availability at short notice as events and the clients’ unique Court Stenography requirements dictate. Contact us by email at gmalone@gmss.ie to discuss your requirements, or at the number above. 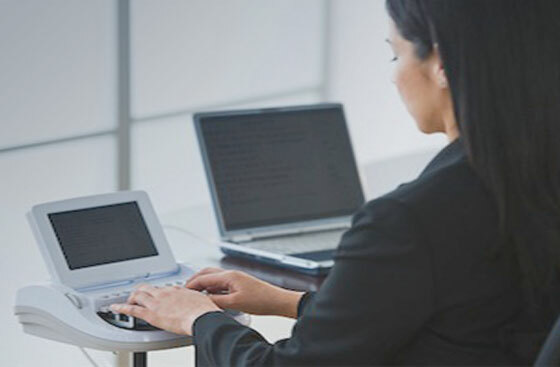 GMSS provides the most experienced and professional Court Stenographers to a litany of public and private clients dependent upon our services. We are confident that our Court Stenographers’ genuine commitment to the highest standards of Court Stenography and client services has been the hallmark of our success. Should you require the services of an experienced Court Stenographer, contact us today on 01 878 2000 or gmalone@gmss.ie and we will obviously be very happy to assist you with all of your Stenography requirements.